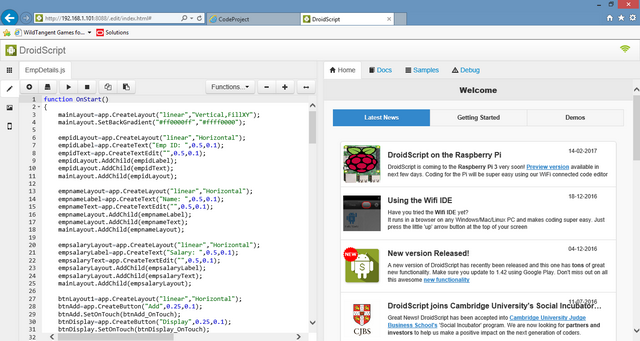 With this article I want to introduce the readers of CodeProject to the DroidScript app. DroidScript is an excellent app using which one can very easily create various types of apps like database apps, messaging apps, mailing apps, etc. Also one can easily access various sensors on a mobile device like accelerometer, compass, camera, GPS & so on. 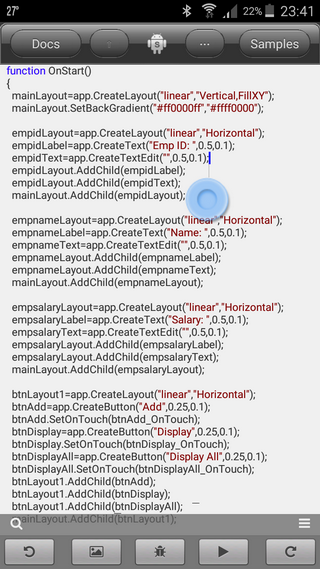 The DroidScript app comes with a built-in editor to create apps within the device. It also allows you to create or edit scripts within a browser using a WiFi editor on a PC by pressing the small arrow button on the top. This article shows the use of the DroidScript Android App to develop apps for the Android platform. 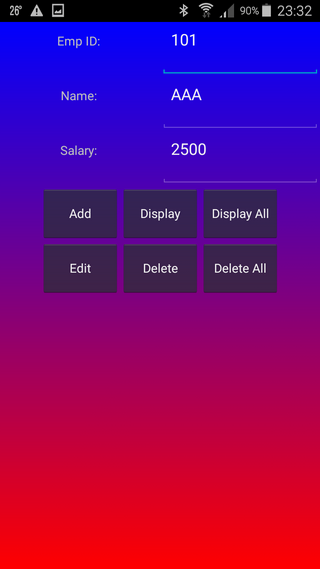 This demo app is a simple database app that inserts, updates, deletes and queries data in the device’s SQLite database. This app creates a sample database called empdb. Then it creates a table called emp having columns empid, empname and salary. There are six buttons, Add, Display, Display All, Edit, Delete and Delete All to perform common operations on the database table. Layouts can also be nested inside one another to create complex layouts. For example, the following code creates three buttons horizontally laid out in the main layout. The SetOnTouch() function of the button object specifies the event handler for the click event of the button. A database can be created or opened (if it already exists) by using the OpenDatabase() method of the app. The ExecuteSql() method of the database object can be used to execute any SQL command on the database. The following code creates or opens a database called empdb and creates the emp table if it does not exist. Other DML operations and queries can be performed on the table by using the ExecuteSql() function. The following code can be used to delete all records after confirmation. It displays a user defined dialog box to get confirmation from the user before deleting the records. The functionality of the DroidScript app can be further enhanced by downloading and installing or purchasing several plugins from the Plugins menu in the app. 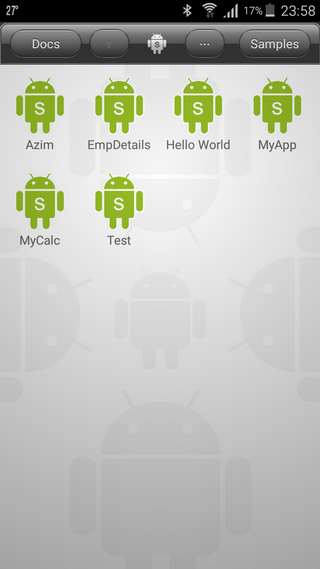 For instance you can purchase the ApkBuilder plugin to build stand-alone Android Package files.